Reference number for this case: 4-Nov-54-Chaunay. Thank you for including this reference number in any correspondence with me regarding this case. 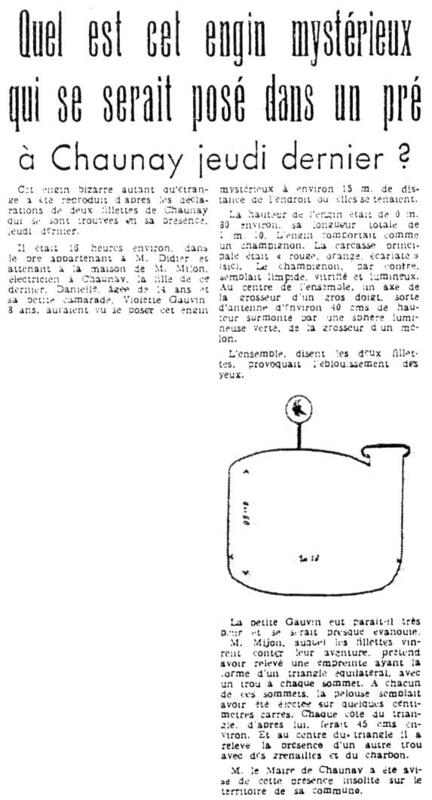 The regional newspaper Le Libre Poitou for November 10, 1954, reported on page 4 the statements of two girls from Chaunay who said they have been confronted to a "strange odd machine" on November 4, 1954. Around 4 p.m., in the meadow belonging to Mr. Didier and next to the house of Mr. Mijon, electrician in Chaunay, the daughter of the latter, Danielle, 14, and her friend Violette Gauvin, 8, reportedly saw the landing of a craft about 15 meters away from where they were. The height of the craft was about 0.80 meters, its total length of 1.10 meters. It featured "like a mushroom" that seemed "limpid, vitrified and bright", the main carcass was "red, orange, scarlet". In the center of the set, an axis of the size of a big finger like a sort of antenna about 40 cm in height was surmounted by a luminous green sphere the size of a melon. The girls said that it dazzled their eyes. It is said that the Gauvin girl was very scared and almost fainted. 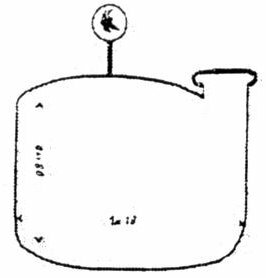 Mr. Mijon, to whom the girls went to tell their story, claimed to have found an equilateral triangle-shaped imprint, with a hole at each top. At each of these summits, the lawn seemed to have been ejected on a few square centimeters. Each side of the triangle, according to him, would be about 45 cm. And in the center of the triangle, he noted the presence of another hole with shots and coal. This odd as well as strange machine was sketched according to the statements of two young girls of Chaunay who were in its presence last Thursday. It was 4 in the afternoon approximately, in the meadow belonging to Mr. Didier and adjacent to the house of Mr. Mijon, electrician in Chaunay. His daughter, Danielle, aged 14 and her young comrade Violette Gauvin, aged 8, have allegedly seen this mysterious machine landing at approximately 15 meters away from the place where they were. The height of the machine was of 0 m 80 approximately, its total length of 1 m 10. The machine comprised a sort of mushroom. The main body was "red, orange, scarlet" (sic). The mushroom on the other hand seemed limpid, vitrified and luminous. In the center of the unit, an axis of the size of a large finger, came out as an antenna of approximately 40 cms height, topped by a green luminous sphere, the size of a melon. The unit, say the two young girls, caused the dazzling of the eyes. Young Gauvin had appeared very frightened and had almost fainted. Mr. Mijon, to which the young girls told their adventure, claims to have found a trace in form of an equilateral triangle, with a hole at each top. At each one of the triangle's corner, the lawn seemed to be have been ejected on a few square centimetres. Each side of the triangle, in his opinion, would make 45 cms approximately. And in the center of the triangle he found the presence of another hole with shot and charcoal. The Mayor of Chaunay was advised of this strange presence on the territory of his community. 11/08/54,1600, France, Chaunay. 1 m object, traces. Reliable witnesses reported seeing a luminous sphere land at the edge of a forest and become dark. Next morning an area 18 feet in diameter had no leaves, and the earth seemed to have been dug up. Luc Chastan indicates that in the Vienne in Chaunay on November 4, 1954 at 16:00 hours, "two girls see an object land at about fifteen meters from them in a field. The object is orange red scarlet and comprises a kind of mushroom like vitrified. Above, an axis the size of a finger is topped by a green sphere of the size of a melon. The height of the object was estimated as 80 cm by 1m 10 of width. The object was dazzling. The two children were very afraid. The father of one of them discovered at the landing spot a trace in the shape of an equilateral triangle with a hole at each angle. The ground seemed to be ejected at each spot. In the middle of the triangle another hole, with presence like shot and coal." Luc Chastan indicates that the source is my website by giving the old URL of its home page. The website indicates there was a sighting in Chaunay, France, at 4 p.m. on 4 November 1954. The website indicates that the sources are "Newspaper Clippings". The website indicates that on 8 November 1954 at 16:00 in Chaunay, France "A daytime disc was reported on a farm." The source is said to be "Hatch, Larry, *U* computer database, Author, Redwood City, 2002". The described object does not resemble any known flying apparatus. But the story comes from two young girls, the traces found by a parent are not extremely convincing, and no investigation was conducted. It is therefore an "unidentified" but reliability and credibility are rather weak. [lp1] Article in the regional newspaper Le Libre Poitou, page 4, November 10, 1954. [---] Article in the ufology magazine Lumières Dans La Nuit (LDLN), France, #325, page 34, January / February 1994. [tp1] "Physical Traces", article by Ted Phillips in the ufology magazine MUFON UFO Journal, Mutual UFO Network (MUFON), USA, #456, page 17, April 2006. 1.0 Patrick Gross January 18, 2009 Conversion from HTML to XHTML Strict. First formal version. Additions [lc1], [ud1]. 1.1 Patrick Gross March 8, 2010 Addition [tp1], [ud2]. 1.3 Patrick Gross December 2, 2017 Addition [lh1], Summary. Explanations changed, were "Not looked for yet."